Fireworks: Every night after a concert but NOT ON 4th of July. Price: $15 adults, $10 seniors, $10 kids 6-12. Free 6 and under. Music: Free concerts 8pm each night in the amphitheater. First come, first serve seating. More pricing and hours info such as early bird prices and season passes. These are from last year. I will add the 2019 concert lineup as soon as it is available. I left these up so you can get an idea of what kind of stuff to expect. Free admission with Military ID all day every day. June 14th – Opening Day FREE admission until 3pm. June 16th – Fathers Day, dads free day. June 19th – Pet Food Drive and $1 rides. June 20th, 27th – Kid free Thursdays. June 14th, 21st, 28th, & July 5th – Boomer Fridays. Free admission. June 26th – Bring 4 non-perishable food items for free admission. The year was 1912 – It was over a century ago that the first Alameda County Fair was held. Motorcycles and Chariots raced in these grounds. Adults also competed for prizes in events such as creating the best gopher trap or parasol, manure spreader, and even hand churned butter. There was a penmanship contest for children to compete in where the prize was a $1.50 cash reward. Clydesdale horses(not the Budweiser Horses) were on display just like now, true work horses. Mules were popular back then too and had their own division of shows. The Alameda County Fair has grown over the century into the largest Fair in the San Francisco Bay Area. Located way out in Pleasanton, CA one would not even think it is part of Alameda County(or even the Bay Area). But on the very edge of Alameda County they host the fair annually at the Alameda County Fairgrounds. During the week the evening winds are filled with the aroma of delicious treats such as fluffy funnel cakes, golden fried corn dogs, bacon covered in chocolate and more. Over the decades the fair has changed. In 1912 they had more farm animals on display and less rides. But as entertainment has evolved they now have roller coaster and other fun rides for children and adults alike. The Alameda County Fair actually owes its start and origins to horse racing and horse racing remains a big draw to the Alameda Fair. In 1859, a man by the name of Augustin Bernal(Bernal Ave.) built a racetrack in Pleasanton on part of his land from his family’s Mexican Land Grant. These races are the start of the Alameda County Fairgrounds. The one mile track is said to be the longest continuously operating race track in America. In 1911 the track was sold to Rodney MacKenzie, son of a railroad tycoon. He joined other community leaders in 1912 to create a fair association. Initially they had to sell one hundred dollar certificates raising $10,000 to make improvements and start the construction of other buildings. Famous newspaper publisher William Randolph Hearst’s mother Phoebe Hearst had a lot invested in the fairgrounds and would use it the following year. She let the fairgrounds borrow workers from her Pleasanton estate to help setup the fairgrounds for the very first year. By agreement or by chance Hearst’s ranch clean swept as the 1913 fair’s sweepstakes winner in best and most varied exhibits of farm produce. Just like the old days when you go to the fair you will find a lot of farm animals, fresh produce and other old school attractions. Mixed with the modern rides, masses of junk food, live music, fireworks and more! Somehow a hypnotist is still active and gets people to cluck like chickens up on stage in front of a crowd. 1859 – Augustin Bernal built a racetrack in Amador Valley, current fairground site in Pleasanton, CA. 1859 – 1866 The floral and vegetable fair was held in downtown Oakland from 1859 until 1866. 1866 – 1868 Fair is held in Hayward, CA. 1911 – Rodney MacKenzie, born into money, buys the racetrack from Bernal and invests around $250,000 to add a grandstand. 1912 – Rodney MacKenzie and other businesses start raising $10,000 to invest in the fairgrounds. 1914 – Fair ends after only a few years due to financial. Stays shut down till 1939. 1933 – California Legislature legalizes pari-mutuel betting in order to raise money for fairs. 1939 – Alameda County Agricultural Association (ACAA) is formed and holds the first modern fair to promote and encourage farming agriculture, animal stock raising, agricultural manufacturing and to promote Alameda County as a prosperous place to live. 4 Carnival rides total. 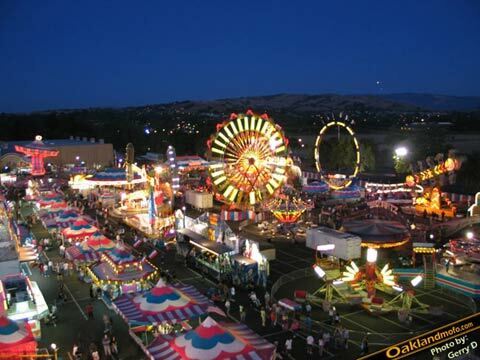 The fairgrounds are located in Pleasanton, CA and easy to access. Here is a detailed map. The county fair schedule, events, concert lineups and dates are all provided by the Alameda County Fair Association. Details may change.